Polaris Razor S Real World Review! Polaris Razor S - Real World Review. The Polaris Razor S was a new model in 2009 and continues in 2012 with a few changes. It looks like Polaris paid attention to their dealers and customers with this higher performance version. The original RZR was a giant leap forward for performance UTVs when it came out. But - there were complaints about the high speed handling and stability. This new RZR S model aims to stop the murmuring. Intended for more wide open spaces and higher speeds, it's 10 inches wider, has 12 inches of suspension travel, and goes 63 mph. Great news about the Razor S for 2012 is the new lower price of $12,699 - down from the original price of $13,999! Polaris Ranger RZR S shown with a few of the available dealer installed accessories. Included are Sport windshields, aluminum roof, front bumper, and doors. Check out this video to get up close and personal with the differences between the original Polaris Razor and the RZR S. This is the most complete video review out there, so even though it's a little long, it's well worth watching. Polaris Razor S - Worth the Extra Dollars? Even though this Polaris Razor S costs awfully close to crazy money - it actually may be a pretty good deal. If you were going to buy a stock RZR and modify it for more open spaces and higher top speeds ... You would spend close to $4,000 on just the suspension! So add in the wheels and tires, extra hp, and a few other odds and ends - maybe it's not such a bad deal? Especially at the lower price for 2012! 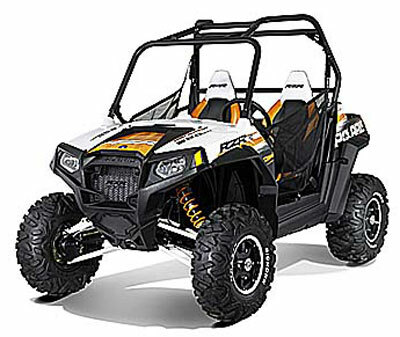 A special Ranger RZR S LE version is also offered at the same $13,999 price of the original Razor S. The LE package has two color options - white/orange or silver/red. The LE package includes Fox Podium shocks - Maxxis Bighorn 12" tires on Crusher wheels - custom 3 color seats with RZR emblem - color matched front and rear springs - White Lightening painted control arms and dash panel. If you decide that negotiating tight woods trails is more important, the original Polaris RZR will still be available. It also continues in to 2012 with a few minor changes. But don't think you have to settle for either of the stock Ranger RZR models. There are thousands of Polaris Ranger accessories for both models that can make them capable of just about any kind of riding you want to do. You can add accessories like these for any kind of riding you like! 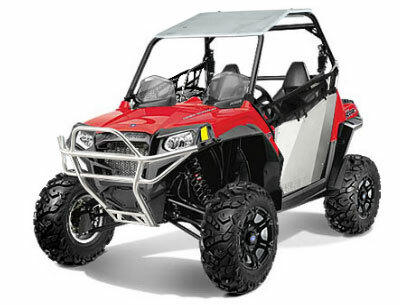 The track system, front bumper, winch, hard cab, and LED light bar are all carried by your Polaris dealer. Here are the specs for the 2012 Polaris Razor S for your viewing pleasure. 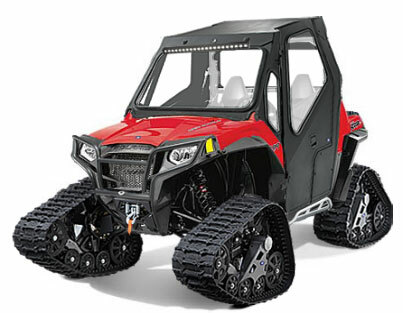 Polaris UTV - Exclusive reports on all the Ranger and RZR models.